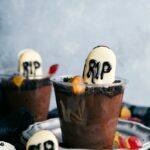 Right above this text is a quick video tutorial (2 mins, 23 seconds) overviewing these 5 easy Halloween treats! 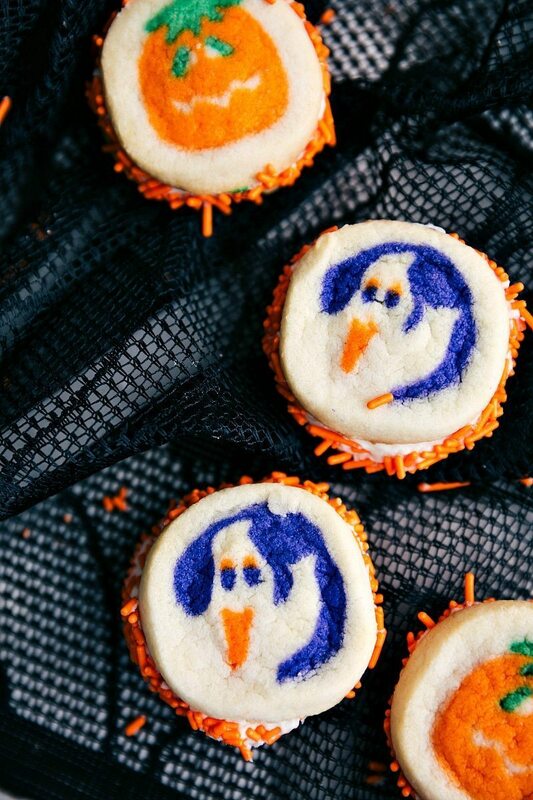 Below is an individual and recipe for each of these easy Halloween treats. Enjoy and Happy Halloween! 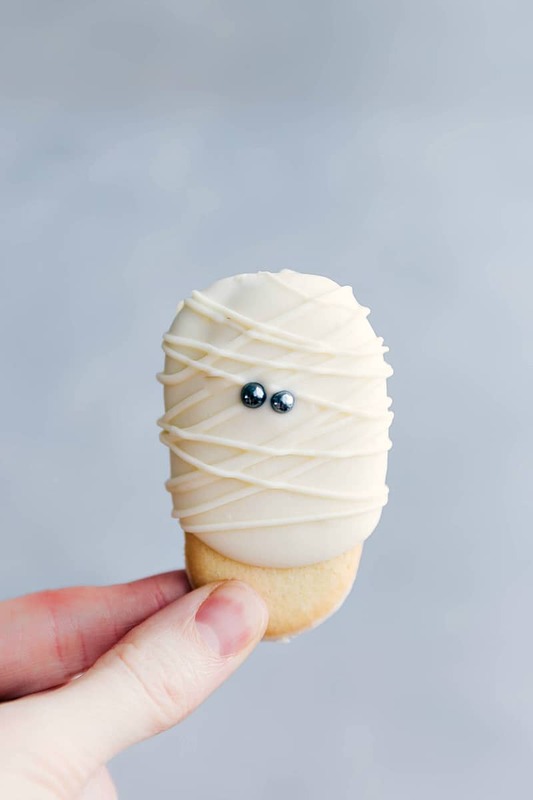 Simple to make mummy cookies made out of Milanos! Holding the cookie in one hand and holding a spoon in the other hand, spoon the melted chocolate over the top 2/3rds of the cookies. Lightly tap the cookies on the edge of the bowl to get a nice even coating of chocolate. (Don't dip the cookie in the chocolate because the chocolate in the milano will mix with the white chocolate). Place the dipped cookies on prepared baking sheet and allow to completely dry. Cut the very edge corner off of the bag and then pipe the melted white chocolate over the cookies to form the "bandages" of the mummy. Prepare the pudding according to directions on the box and, using a spatula, gently fold in the thawed cool whip. Fold together until smooth. 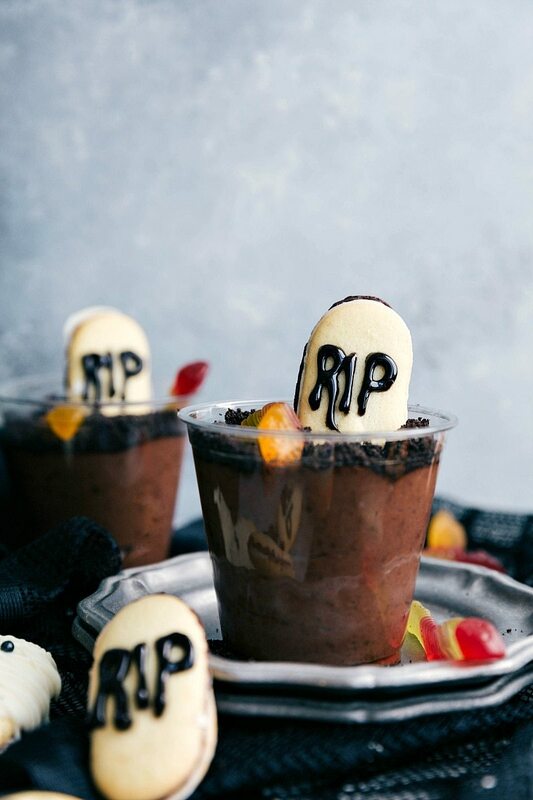 On the milano cookies, use the edible food gel to write "RIP" on each one. Right before serving, add the milano cookies to the pudding cups (they get soggy if added in advance). If desired, add in a gummy worm on top. 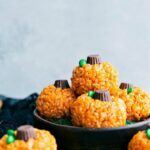 This recipe makes both Frankenstein and Pumpkin Rice Krispies! If you just want to make one or the other, follow the directions to making the krispies treats, but don't separate the marshmallow mixture into two parts. 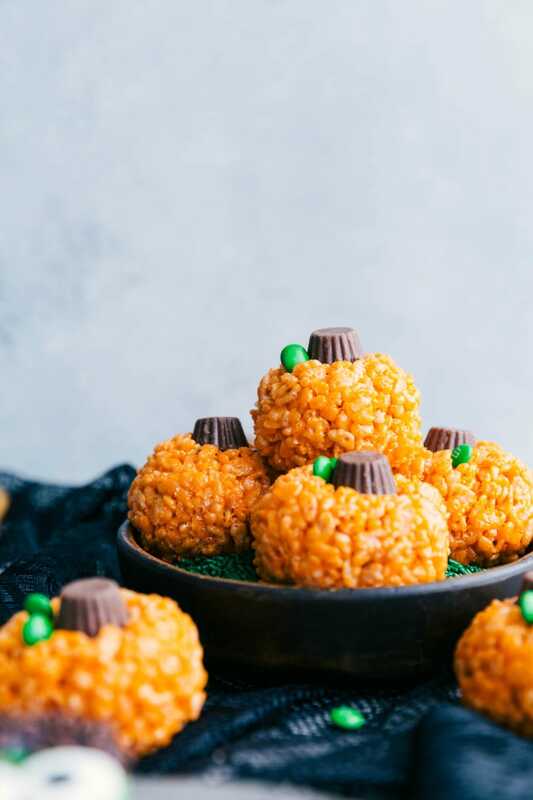 Instead, simply dye the single marshmallow mixture either green for all Frankenstein krispies or orange for all pumpkin krispies. The rest of the "decoration" ingredients will need to be doubled. If you are just making the Frankenstein krispies, you'll want to use a 9 x 9 pan and you'll have thicker Krispies treats. Line an 8 x 8 inch pan with parchment paper (or foil) and lightly spray with cooking spray. Set aside. In a large pot, add the butter and place over medium heat. Melt, stirring occasionally. As soon as the butter is melted, add 8 cups of the miniature marshmallows. Stir constantly until the marshmallows are JUST melted. Remove from the heat and stir in the salt, and vanilla extract. Separate the mixture evenly into 2 bowls. Dye the marshmallow creme in one bowl green and the other bowl orange. Add 3 cups rice krispies cereal to each bowl. Mix until all the ingredients are well incorporated and then press the mixture gently into the prepared pan. Lightly spritz your hands with cooking spray and then gently press down the krispies treats. Don't press them too hard as you'll get a denser krispie treat. Set the krispies aside to harden a bit. Meanwhile add the black candy melts or milk chocolate and vegetable oil to a microwave safe bowl. Microwave in bursts of 15 seconds stirring in between each burst for 10 seconds until the chocolate is melted and smooth. Cut out the krispies to 12 even sized bars. Dip the top of each bar into the melted chocolate. If desired, add chocolate sprinkles to the top. 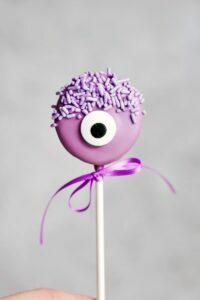 Using the remaining melted chocolate and a spoon, carefully spoon some of the melted chocolate onto the back of the edible eyes and press to attach right below the "hair." Do the same for the miniature Reese's on both sides of the krispie treat. Let harden and then use the black food gel to pipe a zig-zag line for a mouth. Mix until all the ingredients are well incorporated and then lightly spritz your hands with cooking spray. Grab a handful of the krispies mixture and gently form into a ball. 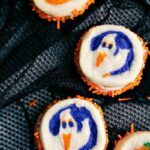 Avoid compressing the treat too much as you don't want a hard/dense treat. Press a miniature reese's cup into the top of the pumpkin and re-shape as necessary to form the ball and get the reese's cup to hold in place. Press in 1-3 miniature M&Ms to make it look like small leaves. The recipe above this picture is to make BOTH the Frankenstein and pumpkin krispies. If you just want to make one or the other, follow the directions to making the krispies treats, but don’t separate the marshmallow mixture into two parts. Instead, simply dye the single marshmallow mixture either green for all Frankenstein krispies or orange for all pumpkin krispies. The rest of the “decoration” ingredients will need to be doubled. If you are just making the Frankenstein krispies, you’ll want to use a 9 x 9 pan and you’ll have thicker Krispies treats. Bake the cookies according to package directions. Set aside and let cool completely. Meanwhile, prepare the frosting (if making homemade): in a large bowl, beat cream cheese and butter until fluffy. Add powdered sugar, vanilla and salt; beat until completely smooth. Frost the bottom side of half of the cookies. Place another cookie on top to make sandwich cookies. Pour the sprinkles into a shallow dish and rotate the center frosting of the cookies around the sprinkles until evenly coated. It sounds like you had too much butter; I use 5 tablespoons total. Also I’d recommend measuring the marshmallows. If you follow the exact quantities in the recipe I don’t think you’ll have any problems with the treats forming properly. If they are still too wet, try adding a bit more rice krispies. Enjoy! 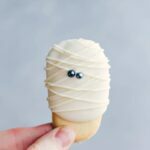 Could I freeze the mummy cookies?